The Xbox Live Marketplace has a bold new name. "Xbox Live Marketplace" never had much of a ring to it, did it? 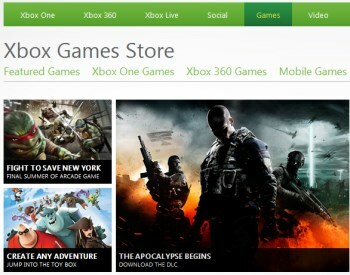 So not too terribly far ahead of the launch of the Xbox One, Microsoft has given it a bold and daring new name: Xbox Games Store. Okay, so maybe that doesn't exactly ring the bells of the holy cathedral either. At least it's more to the point, and easier to type, too. I'll take what I can get. "That's right, [Xbox Live Marketplace] is now called the Xbox Games Store, and will sit alongside the Xbox Music Store and Xbox Video Store," a Microsoft rep told Joystiq. "This is to make it easier for consumers to find content both on Xbox 360 today and Xbox One when it launches in November." The changeover comes just days after Xbox Live transitioned from Microsoft points to real money.